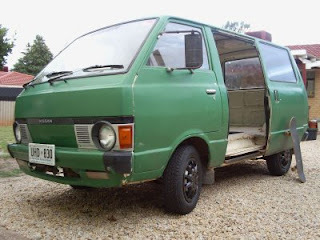 The van is a 'project' because I hope to do the thing up and turn it into a basic camper van that can still be used as a load carrying vehicle if need be. Hence anything I add into the back in the way of tables, beds etc. MUST be able to fold up out of the way as much as possible. 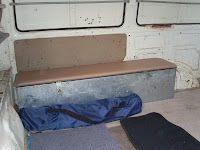 As a small move in that direction I've added a padded seat to the top of the metal tool box that is currently fixed permanently inside the van. It's just the right height to sit on and will be ideal when partnered with a planned fold out table. Long term I'll be installing power points for recharging my laptop which will eventually have 'mobile' Internet. When that happens I truly will be able to work from anywhere. Well anywhere that has mobile Internet coverage anyway. A step closer to my dream of becoming my name sake, The Extraordinary Tourist. In the mean time I'm learning more about cars. 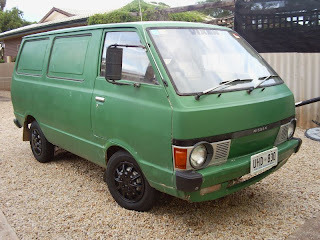 After the van became mine I discovered it didn't like traveling up steep hills. Seriously it was like 'the little engine that could', "I think I can, I think I can..."
I thought it might have been an issue with a dud spark plug but I was talking to my partner's brother one day (who knows more about cars than I) and he mentioned it might be a fuel pump issue. At the time I was sceptical because I knew the carburetor wasn't having any trouble filling with petrol but my spark plug theory turned out to be a dud so I moved on to the fuel pump suggestion. Turned out a vacuum hose attached to the fuel pump had split at each end breaking the seal. I replaced it and the van hasn't had any problem going up steep hills since. I would never have thought to even look at the fuel pump - left to my own devices. For the most part the van now runs fine however starting it for the first time on any given day can be a bit hard. It turns over confidently but struggles to fire. I'm thinking an oil change may help since I've been told the oil wasn't changed even when the cylinder head was pulled out and fixed. Who knows how long that oil's been in there since, prior to that, the van had been sitting in some one's garage/driveway for ages. It still also runs on every now and then when you turn off the key. Again an oil change might help. I don't know really but it couldn't hurt. If you know anything about four cylinder carburetor engines and the symptoms sound familiar to you feel free to share what you know in the comments. I'd appreciate the help. My dad gave me one. Its great but hard to find parts. I had this start prob and a new set of leads fixed that. 30 yearold leads no good.